I know it only takes about 5 seconds or less to apply a vacuum to that tube that size with a good vacuum pump. At 120 volts and 10 amps, that's not much power or energy going into this cannon. I'm no expert on these things, but it seems to me that there is a lot more energy coming out than there is going in. I know that's supposed to be impossible, but it sure looks that way to me! If someone could figure out a way to harness this atmospheric pressure energy and make an atmospheric engine, they will have a nice little motor on their hands. This brings us to a guy named Thomas Newcomen. He is the person who is credited with inventing the very first working steam engine (or atmospheric engine). He did this about 65 years before James Watt made his improvements. 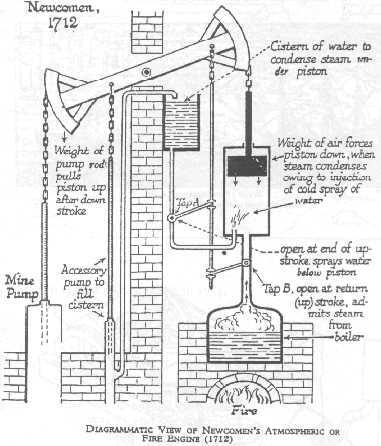 Around 1712, Newcomen invented an engine that used steam to raise a piston. What's neat is what he did next... he injected cold water into the cylinder with the steam in it to condense the steam and thus create a vacuum. Then our old friend "atmospheric pressure" took over and pushed the piston down with great force. The cycle then started all over again with injected hot steam that pushed the piston up. His engine was mostly used to pump water out of mines. There are several ways to create a vacuum... an inventor named Bernard Rowe invented a vacuum engine or atmospheric engine in 1976 that used ammonia as the gas. The patent # is 3,945,211 and can be accessed by clicking HERE. Ammonia gas is easily condensed into water and then can be turned back into a gas by heating the water. 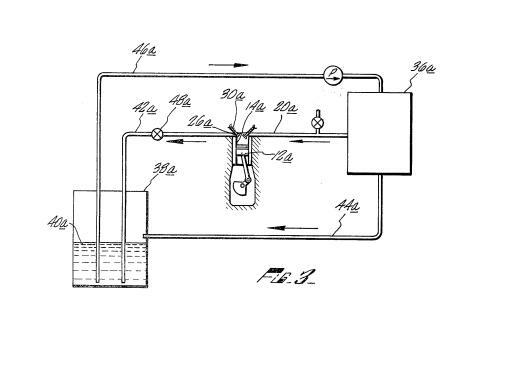 Rowe used the expansion/compression cycles to operate a simple piston that had high pressure and low pressure (vacuum) cycles just like Newcomen's atmospheric engine.